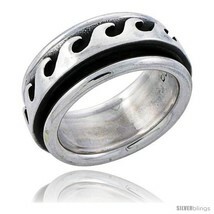 Retail Price: 110.00 - Save 56% Off! 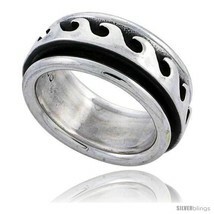 his Solid Sterling Silver Ring is Antiqued Finished To Highlight Detail. Very unique and hand-made ring so each ring looks a bit diffrent and waves on the ring are not all the same size An everyday Ring with average quality, Very reasonably priced. Sizes are available from 7 to 14, with half sizes. The middle part of this Ring rotates (spins). The Band measures over 5/16 (9mm) Wide.